What does Mike Tyson think of the upcoming boxing match between Floyd Mayweather Jr. and Conor McGregor? What about former UFC lightweight champ Eddie Alvarez, the Philly native who was McGregor's most recent opponent? Where does George Foreman stand? How about a fellow Hall of Famers from the other discipline, like Bas Rutten or Forrest Griffin? Well, we asked them – along with a bunch of others, ranging from Sugar Ray Leonard and Evander Holyfield to current UFC women's strawweight champ Joanna Jedrzejczyk – to offer their overall opinions on the upcoming Pay-Per-View bout. Whether they wanted to make a prediction or weigh in on the "spectacle" of it all, we didn't care. We just wanted to hear from a collection of people who know the fight game better than pretty much anyone else on the planet because, well, they live it. “Floyd is one of the greatest defensive boxers of all-time, and Conor McGregor isn’t skilled enough to outbox Floyd. It’s actually going to be funny, more like a joke, because McGregor hasn’t even had an amateur fight and he’ll be getting in there with someone’s who is the best boxer of this generation. “The Mayweather-McGregor fight has to be called ‘an exhibition’ only. It’s not a real boxing match. Mayweather wins. There’s no questioning that. It doesn’t tarnish boxing though. Ali goes down as the greatest, but remember when he fought Antonio Inoki, it did not tarnish boxing. There really are no winners or losers in this. “Believe it or not, I’m going to go balls out and go for McGregor in this. There is a 10- to 20-percent chance he can win, but I know he has it. I’m going to support Conor and throw it out there. He’s so convincing every time he makes a prediction. When he says he’s going to stop Floyd in four rounds, I know he only has a 10-percent of doing that. At the time, I never thought he could beat Jose Aldo. Aldo was always one of my favorite guys, and he’s an incredible striker. For Conor to literally say he was going to knock him out before the fight, and then go and do it, that convinced me. “I know if Conor could beat Floyd it will be the greatest upset in sports history, and that’s what I’m hoping for. If you break everything down, let’s start with the trash talking. He’s going to get into Mayweather’s head. Then with Mayweather, he’s going to have way too much pressure on him. I say it’s almost like fighting a girl. Mayweather can not lose this. If he does, he loses to a guy who’s had his first professional boxing match. If he wins, well, he was supposed to beat the guy. Floyd wants the 50-0, and everyone he’s meeting, they’re going to tell him how easy a fight this is going to be. Every fighter knows this, the more people tell you how easy it’s going to be, the more pressure you’re going to get, because now you better do what they say. “Let’s talk about Conor’s awkward style. He comes from different angles. The distance is different; he’s further away. He has a longer reach and throws crazy punches. It’s like every time I would spar with a kickboxer, you get hurt, because they do things differently. Guys just starting don’t fight according to the rules, because they’re just learning. It’s what I really see Conor has. Floyd will be facing an awkward style, and an awkward stance. He’s never really fought a guy like Conor before. Now if Conor is going to come straight at him, Floyd has had problem with brawlers in the past. Floyd needs three or four rounds to figure out his opponent first. “That’s a Mayweather fight. He gathers all of his information the first three or four rounds instinctively and that’s when he puts his game plan together because he is this phenomenal boxer. He needs to survive those first three or four rounds. I know it’s a longshot for McGregor to win. With all of the pressure, the awkward style, and Mayweather is 40, but I don’t see that as a problem, it stirs up your equilibrium and you start doubting yourself. Pressure can get to people. “This is a spectacle. It’s what the Pride Fighting championships used to do. A really big guy against a smaller guy. Here you have an incredible boxer, undefeated, the best defensive fighter on the planet fighting a guy who never boxed a professional match in his life, even though he is a two-division UFC champion. It’s a big-money fight and McGregor can’t lose this. There is zero pressure on him. If he loses, he pockets $80, $100 million. If he wins, he shocks the world. There will be 5.5 million pay-per-view buys. I see that happening. “I think it’s great entertainment and something that can definitely capture everybody’s attention, because people are willing to pay to see it. It’s a great event. You have the best in boxing right now with Mayweather, and you have the best in a whole other sport in McGregor. But this is a boxing match. So you know who’s going to win. “What can McGregor really do against Floyd? How can he possibly win, if you have world champions that can’t beat Mayweather? The only thing McGregor can hope for is to catch Mayweather with a good shot. That’s what everyone plans to do against Floyd, but planning to do it and actually doing it against some like Mayweather is completely different. It’s never been done. “I won’t call it a joke. People pay for entertainment. Both of these guys are professional fighters. They’re making the sacrifices to get in the ring and do this. Floyd is risking the most, because he has everything to lose. Just imagine if McGregor does hit him with a lucky punch and stops him. That could be beautiful, and good for the game, because it would show anything could happen. Look, no one thought I would beat Mike Tyson the first time we fought. This is different, because this is someone who never boxed before in his life. "I'm excited that it's happening. I like every MMA guy. I'm secretly hoping that there's some way Conor can catch him with something – he's got plenty of power in his left hand. It's a long shot, but the fact that MMA is now the fifth major sport, that was a longshot 10 years ago. That's happened. Never say never. "I learned a long time ago not to try to predict fights. But if we're looking at it practically, we're talking about a guy who is undefeated, the best in the world probably, against a guy that was pretty good at Olympic-level boxing in a country of three million [people] a decade ago." “Naturally, I respect the talent of both of these guys, but to be honest, I never thought it would happen because the whole thing was debatable what they were going to do, box each other, or outright fighting? Apparently, it’s boxing, so you have to lean towards Mayweather, plain and simple. The execution of their punches is a whole different ballgame. A boxer’s punches are more direct, balanced. McGregor can’t throw a punch like a seasoned fighter like Mayweather. They come wider. “It’s two different sports. One, you can pretty much do whatever you can do with your arms, legs, feet, and elbows, whatever. The other is the pure science of boxing. “It’s a boxing match, an event, some say it’s a joke, but in my opinion it’s all of the above. It’s a spectacle, a joke, a boxing match, an event. What’s intriguing about it is the curiosity of what’s actually going to happen. Mayweather is going to win hands down, no question, but Floyd is now 40. McGregor is 28. That’s a difference. What will sell this matchup is boxing fans saying Mayweather and MMA fans saying McGregor has a chance. One punch can change everything, but when you’re dealing with someone like Mayweather, one of the best defensive fighters of all-time, he won’t make it easy for McGregor. “Since they’re going 12 rounds at 154, Mayweather wins and probably wins easily. I’ll be there. I do want to see it. I remember many, many years ago when Muhammad Ali fought Antonio Inoki, who kept falling on his back and kicking at Ali. McGregor can’t do any MMA stuff, but the best chance for him is to make it a total street fight, because he won’t outbox Mayweather, because no one does. 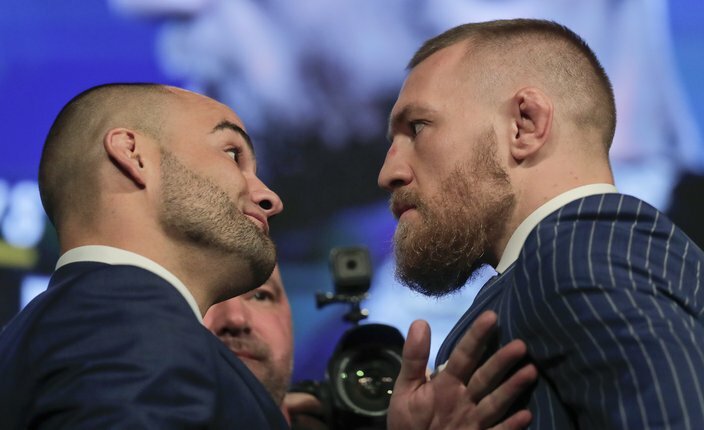 Former UFC lightweight champion Eddie Alvarez, left, stares down Connor McGregor. "I'm a fight fan first and foremost, so any fight, I'm going to tune into it for sure. I think given Floyd's age and his layoff, this couldn't be a better time for Conor to step in and fight him. That being said, it's a boxing match. Anything can happen. "I think Conor's best chances are within the first four rounds. Anything after four rounds or so, it could turn into a regular Floyd Mayweather fight, where he just runs and chips away at him. So I think Conor's best chance is catching him hard sometime in the first four rounds. And I do think that can happen, that's definitely a possibility, but I think it's what has to happen in order for Conor to win." “This is a joke. Come on, man, are you kidding me? We have a major fight between Gennady Golovkin and Canelo Alvarez going on three weeks from then. This is a spectacle. That’s what it is. You have a show, that’s what this is. You have a fight, and that’s what Golovkin-Alvarez is. “Why does this spectacle even merit any attention? “Doesn’t anyone see what Floyd is doing? He’s playing all of you guys, in the media, the fans out there. What are we talking about here? The public is getting blindsided by this. A judge always tells the jury never get distracted by any outbursts. That’s what is happening here. The judge needs to instruct the jury that this thing never happened. Boxing deserves more respect than this. It’s sad, it really is. Why mix apples and oranges like this? Are we that bored, do we have nothing left to do at home? “Mayweather-McGregor is good conversation. McGregor has never had a professional boxing match in his career—and he’s going to take on the best fighter of this era. How much sense does that make? Are we crazy? Can the world’s best volleyball player be a star in the NBA? That’s doubtful. Take a man who never fought an amateur or professional fight, jump over all of these guys who deserve a fight against Mayweather and make McGregor bigger than boxing. I don’t know what’s wrong with us to jump all over this. McGregor doesn’t deserve to fight one of the greatest fighters in the world. This whole thing is disrespectful. I’m not paying for it and I have no interest in seeing it. “I think Conor has done an amazing job of talking his way into a fight like this. He obviously doesn’t deserve a fight like this. He never had a pro boxing match and now he’s going to get over a $100-million payday, or whatever it is, to fight Floyd. But you do have to give him credit for talking his way into that. That’s the point of most fighters anyway, so you can’t really fault him for doing it. As far as the fight itself goes, I think it’s going to be an absolute joke. Floyd is one of the best in the world, if not the best at what he does and that’s boxing. Conor may be a good puncher for MMA sake, but I don’t think he has anything for Floyd. “I look at it for what it is, and that’s an event that’s never taken place. You have a top MMA fighter willing to fight not just a fighter, but arguably one of the greatest of all-time in Floyd Mayweather, and he’s willing to forego all of the rules that he’s comfortable with and do strictly boxing. “You have two charismatic guys with larger-than-life personalities, and a lot of ego involved. I’m surprised they got it done, because I didn’t think it would happen. McGregor is bigger and physically more imposing than Floyd, but anyone that knows anything about Floyd knows it doesn’t really mean anything. I’ll give credit to McGregor for having a big left hand. But I don’t know if he will be able to land that left hand or not. You have to look at Floyd’s age. He’s 40. He’s been off for close to two years. The intrigue is to tune in, but if you are willing to tune in, just understand that you’re getting yourself into. “I have to look at it like Floyd is going to dominate. I don’t know if it’s going to be this clear-cut boxing exhibition. I think Floyd will be Floyd at the end of the day and get his hand raised. To be competitive, McGregor is going to make this ugly at certain points and he’s going to have some moments. How big those moments will be, I don’t know. “If I was a fight fan I would pay for it, simply because you don’t know what’s going to happen. I love MMA, though obviously, I love boxing more. I know a lot of people are downing this fight, but they need to understand Floyd has a lot to lose. He’s risking everything, because if something crazy did happen, he has a lot more to lose than McGregor. It’s interesting. McGregor is willing to risk his reputation, his legacy to go in there and possibly be embarrassed by Floyd Mayweather, forfeiting 90-percent of the rules he’s used to fighting under. He’s willing to put that on the line and talk a lot of smack along the way—I commend the man. If McGregor takes a whipping, he’s going to take it in front of the whole world. Both of these guys have paid their dues. Both of these guys have bled. They have both taken their fair share of punishment. If they can come together and make their fair share of dollars, bringing the two sports together, I don’t see it being a problem. "I think that Conor McGregor will win his fight against Mayweather. He's the [type of] person that can do this and I believe in his words. Like he said, he wants to win this fight in round No. 4, and I believe that he can do this. "What do I think about the fight? I think that this fight is going to be epic. Two of the greatest will meet in the ring on August 26 and I think that Conor is taller, faster, his reach is bigger. I don't think Floyd Mayweather has ever fought someone like McGregor, who is this strong not only physically, but mentally as well. I think this fight is huge for combat sports. I think this will open some new doors for MMA fans and for boxing fans as well. And could even open doors for more UFC athletes to cross over as well. It will be an epic fight." “I haven’t followed McGregor’s career, so I don’t know if he’s ever been knocked out before. He does take knees, kicks and elbows, and for someone to stand up to shots like that, it does mean McGregor can take a shot. Floyd hasn’t knocked anyone out in years, and that tells me Mayweather may not be able to knock McGregor out. “McGregor is younger, in his prime and he’s an athlete. I honestly give McGregor a lot of props as a businessman making this crossover decision. Ironically enough, I think McGregor’s fighting style makes him a boxer. He lost to Nate Diaz the first time, and hurt him the second time they fought. When McGregor knocked down Diaz with straight lefts, he let Diaz get back up, as if taunting him to say, ‘Get back up, we’re going to fight again.’ McGregor’s fundamentals is a boxing style. He has good accuracy in comparison to his UFC competition. “McGregor hopped not only into the world of boxing, but he hopped over a bunch of guys who deserve to fight Floyd ‘Money’ Mayweather. McGregor is dangerous because he has nothing to lose. No one expects him to win, and if he wins, he destroys a legend and becomes a legend. If he loses, he just made the smartest business decision he ever made in his life. 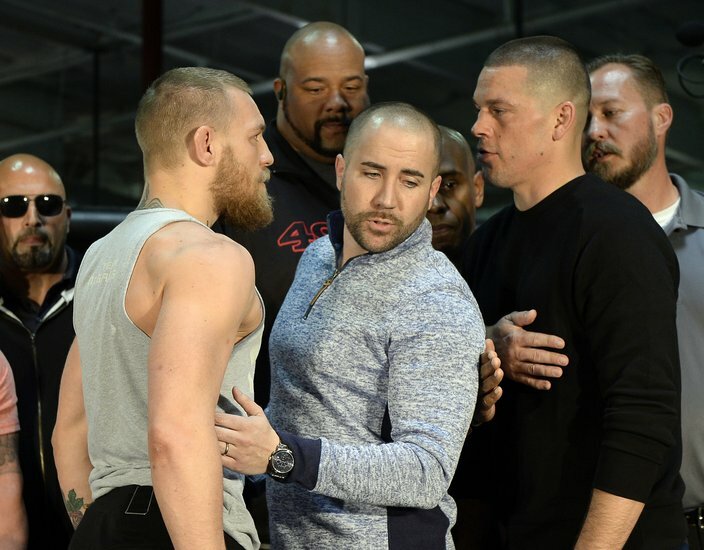 Dave Sholler, center, was the only thing standing between UFC featherweight champ Conor McGregor, left, and opponent Nate Diaz during their pre-fight press conference last year. Former UFC VP of Public Relations (now with Sixers); better known as "The Guy You'd Always See Standing Between Fighters At Weigh-In"
"Conor McGregor truly believes every word that comes out of his mouth. I have yet to work with an athlete who possesses such conviction, confidence and charisma. Conor practices visualization and speaks things into existence. He's the Babe Ruth of MMA in that regard - he points to the fence and knocks it out, many times quite literally. That's exactly what he did here in securing the Mayweather fight. "McGregor says he will finish Floyd inside four rounds, his menacing left hand serving as the ultimate equalizer against boxing's greatest defensive tactician. While I think he'll have a hard time catching Mayweather clean enough to stop him, I have no doubt that he'll exhaust every option trying. "This is Mayweather's fight to lose in the sport he's mastered. If Conor McGregor beats Floyd Mayweather though, we may very well be talking about him as the greatest combat sports practitioner of all time. It doesn't matter whether you think this is circus or spectacle, Aug. 26, 2017 is likely a date in sports history fans won't soon forget."